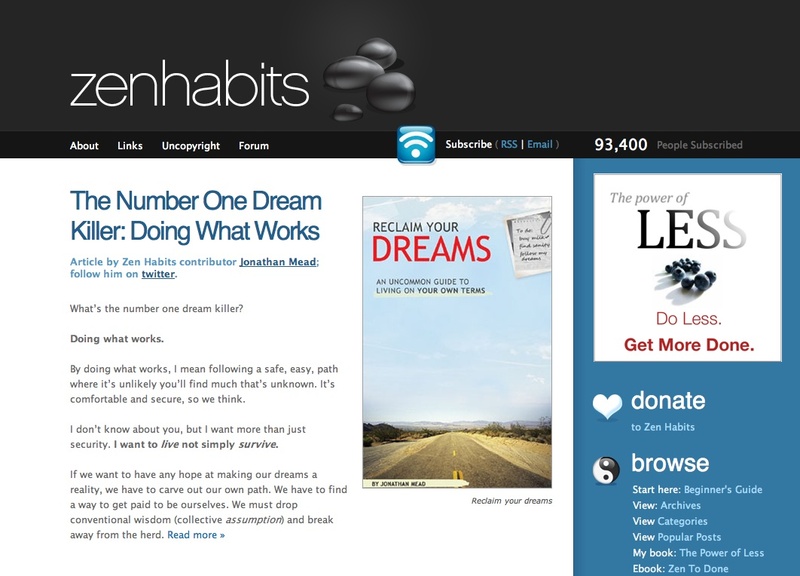 I found Zen Habits, via Time's list of the best 25 blogs of 2009. Leo writes about decluttering your life of things and bad influences, setting goals for yourself, and living a balanced life. I'm really digging this stuff. I'm happily shedding lots of crap from my life right now. Just not Oreos. Or cheesy Nachos. Or my new flowered shirt from the Gap. Well, I like reading about others living a pared down existence. Read this post on the benefits of working from home. I’ve been reading Zen Habits for a while. I don’t agree with everything Leo writes, mostly because some of it isn’t practical for me. But I still find most of it valuable and useful.